Gaines, on Brains: Sound it out: Do you "see" or "hear" words you have to spell? Sound it out: Do you "see" or "hear" words you have to spell? I have an extraordinarily intelligent friend. Halfway through veterinary school, she's a hard worker, an avid reader, and scores highly on standardized and academic exams. She excels at what she does, and I've met few other people in life with her brand of outstanding dedication and commitment. But there is one feature about her that is so strangely unexpected—so strikingly opposite her accomplishments—to the point where it's just comical. She can't spell to save her life. Now don't get me wrong. The spellcheck has saved me more times than not, and while I'm no Arvind Mahankali (13-year-old New York native who just won Thursday night's 2013 Scripps National Spelling Bee; seen above competing in 2011), I never had too much difficulty remembering how to spell words that I'd read. What do we know about spelling, and why are some of our most brilliant peers some of the greatest misspellers out there? For you, reading this blog may be no big deal, but it's striking to learn that 14% of U.S. adults can't read, and an additional 21% read below a 5th grade level. Given the relatively recent development of language in us humans, this may not be altogether surprising—while we began to develop linguistic abilities 30,000 to 40,000 years ago, written and spoken language only emerged around 5,000 years ago. Reading this sentence is, in fact, one of the relatively more complex things your brain engages in. Beyond Broca's area and Wernicke's area—two regions in the left hemisphere of our brains implicated in language production and comprehension, respectively—researchers have also focused on an area called the angular gyrus, pictured in orange. The angular gyrus is proportionally much larger in humans than other primates and is conveniently located at the intersection of touch, sound, and visual processing. If I instructed you to spell the word "knaidel" (Arvind Mahankali's winning word), your angular gyrus would simultaneously take in both visual (ah yes, it's a "k," not a "c") and phonetic ("there's emphasis on the 'a'") information. Damage to this region results in inability to read and, interestingly, copy or write words. Some of us are better visual spellers (seeing a word in the mind's eye, having memorized its spelling) while others are better at phonetics (breaking a word down into its sounds). A 2007 study by Norton and colleagues at Dartmouth College examined this phenomenon in individuals using brain imaging. Twelve participants were instructed to imagine spelling a word that the researchers told them through a microphone while lying in an fMRI machine. Some of the words had simple phonetic spellings, such as "blink." Some had a strange spelling, like "yacht." Still others were non-words, like "shelm." The data collected while participants pictured the words' spellings revealed some interesting findings. 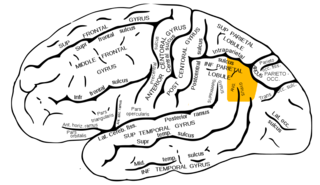 Those words with irregular spellings ("yacht") activated the inferior frontal gyrus, implicated in storing vocabulary, as well as the supramarginal gyrus, which processes written words. On the other hand, regular words led to increased activity in the supramarginal gyrus, which is involved in auditory processing. This makes sense given that simple, phonetic words ("blink") correspond logically with their spelling. Should children be taught to memorize how words are spelled ("cat is C-A-T"), or rather sound them out ("k-ah-t")? That's where the controversy lies. Teaching a visual speller to sound it out, or a phonetic speller to memorize words, may breed poor spelling early in life. Norton and colleagues suggest that schools focus on teaching both styles equally. Many Scripps contestants tout their love of reading and memorizing the dictionary as the secret to their success. My good friend is more likely a phonetic speller, having once seen no problem writing the word "can" with a "k." To which I ask her: may I have the language of origin, please? Image credit: Scripps National Spelling Bee (via Flickr) and Mysid (via Wikimedia Commons). LEGO Faces are Getting Angrier; So What?